A curling stone is a great souvenir after a fun day out on the ice! Only $35 exclusively at the rink.. The Naseby Indoor Curling Centre is the only indoor facility dedicated to curling in the Southern Hemisphere! This is your chance to become a pro at one of Central Otago’s oldest and most iconic winter sports. Indoor Curling is a lot easier than you may think! 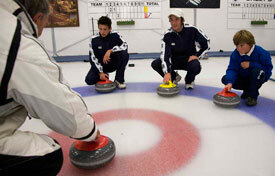 If you would like to learn how to curl like a professional, try one of our great training classes. Our classes are free, so you’ve got nothing to lose! Remember, age is not a barrier in curling. We are also a great venue for school trips! 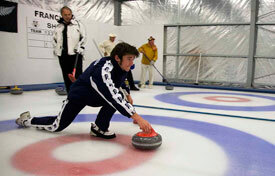 Indoor curling is suitable for kids of all ages and abilities. A trip to our indoor curling rink is the perfect end to a school project on the history of curling in Maniototo. 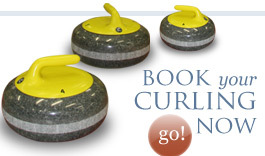 We offer a range or training and coaching classes at Naseby Indoor Curling Rink. Coaching Courses for athletes and coaches are run annually between June and August. Ice making training courses are run annually. Please contact us with your expression of interest! NZQA qualifications in Curling will soon be available. Please contact us if you are interested!